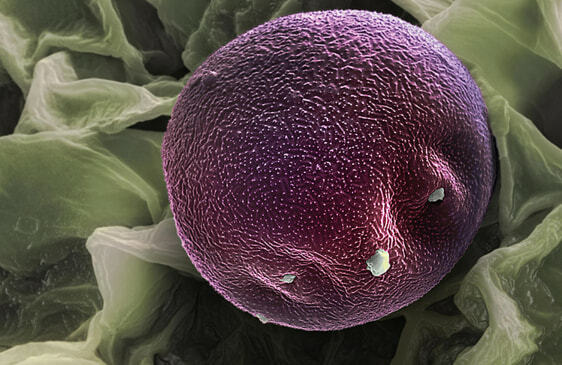 This stunning up-close view of willow pollen was captured by Swiss photographer Martin Oeggerli using modern scanning-electron microscope (SEM) technology and colorization techniques. Despite its allure under the microsope, willow tree pollen is a common early-spring allergen, triggering sniffles, itchy eyes and misery in many parts of the world. 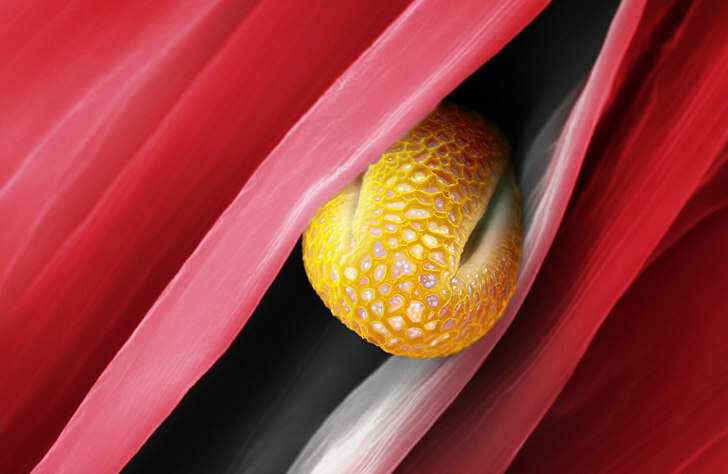 Here, a grain of willow pollen has wedged between flower petals. Alder pollen is a common windborne allergen in wooded areas of North America. The pollen can be found miles away from their source. In some cases, people who are allergic to alder pollen can develop oral allergy symptoms when they eat certain fruits and vegetables. You may have this if you've noticed symptoms such as itchiness, swelling or redness after you've eaten a peach, apple, plum, celery or carrots. Grains of forget-me-not pollen are among the tiniest known, each are just five one-thousands of a millimeter in diameter. Related video Sneezes: More dangerous than we thought? The gray granules are pollen from the snowball plant. One of them has begun growing a reproductive tube. The yellow grains are pollen from another species of plant that have missed their mark. Unlike pictures captured with a camera, SEM scans are based on particle emission rather than light -- they don’t show colors and patterns. By adding layers of color and shadows, Swiss photographer Martin Oeggerli, whose work has appeared in National Geographic, literally "paints the light" in these images. “Certainly, most of my works are inspired by science. But to be finally enjoyed as 3D-realistic artworks of the invisible, the originally black and white electron microscopy scans have to be painted with color,” he says. In this illustration of the process, the original SEM image of a wasp eye is shown at bottom right. Oeggerli's colorful processing is shown at top left.